Conquering the heavy waves of the great seven seas is no easy feat, but for Best of World Travel, it is just a surfing on the spot at Crystal Beach Resort. 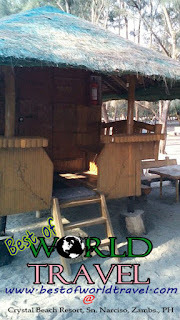 An affordable resort which lies in the depths of Zambales that has an amazing place to expose your inner beach spirit. And of course, it will surely trigger your sense to conquer the world…. through surfing~~ not by the internet, but by the waves of the great seven seas. 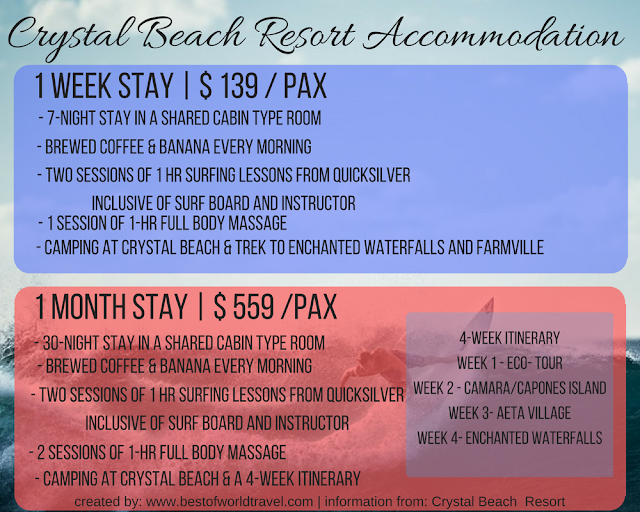 Crystal Beach Resort is not just for surfing, but of course for an awesome family and friends getaway as well! ~~ or a romantic date with your love ones. 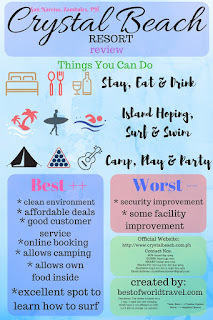 We will now show you a review of Crystal Beach Resort when we took a two-day, one-night camp on their fairy tale like grounds. 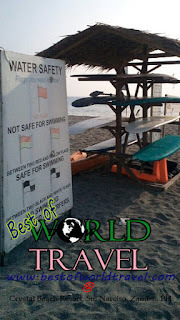 “Crystal Beach Resort is the best in Zambales”, is what the Best of World Travel team had heard over the internet. And because our curiosity sparked, we tried to conquer their empire. 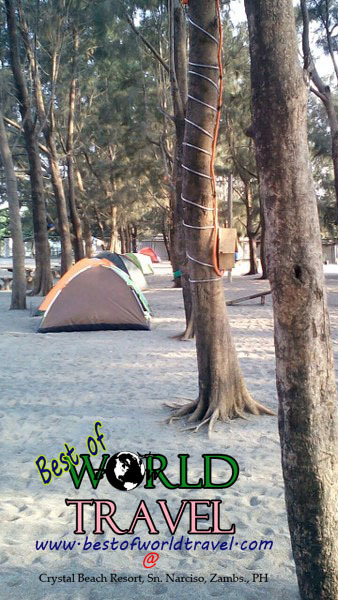 Truth be told, it is just a few meters away from Sabina Beach Resort, and we can easily compare the best among the two. Crystal Beach is rumored to be an affordable beach resort as well where everyone can enjoy above the white sands near South China Sea. Their great customer service, and the gorgeous landscape adds up to her beauty. And do not forget the surfing lessons, the lifeguards stationed on their “tower” and the majestic pigeons. Such beauty and safety. They also host several beach-y events such as Summer Siren, and Beach Clean Up Event where everyone can party. You can actually see their events here. From Manila or NAIA Terminal, ride a Victory Liner Bus going to Olongapo Victory Bus terminal, IBA Zambales or Sta. Cruz Zambales. (Estimated Cost: 200-220 PHP or 5-5.5 USD) But if your bus will go straight to IBA or STA. CRUZ, Zambales, just ask them to drop you off to San Narciso Magsaysay Memorial College. Ask the driver or conductor to drop you off at San Narciso Magsaysay Memorial College or San Narciso Health Center. From NAIA Terminal go straight to NLEX, then SCTEX and exit to Subic Bay Freeport Zone. Exit to Subic Kalaklan gate and head straight North. Follow the GPS and head to Crystal Beach Resort. For those who want to rent a car, you can try to rent at AUTOEUROPE for cheap prices. Ride a tricycle back to Magsaysay memorial College. There will be a lot of Busses and UV Express that will be passing through the National High-way. 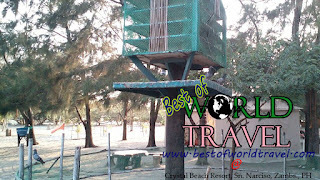 It was no easy feat to book in Crystal Beach Resort at peak season. We tried to book during their Summer Siren Event 2016, but our luck was not fully throttled. In short, we were out of gas. Since the Summer Siren Event needs a ticket that we clearly do not had, we just put our planning to infiltrate the empire into a halt. After a few weeks of scouting, we learned that we can infiltrate their grounds easily, and thus, we decided to prepare. 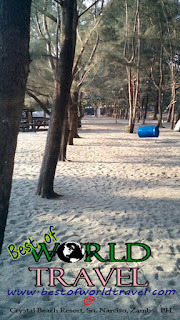 Upon arrival to Crystal Beach Resort Empire , we paid 295 Pesos / person per night for our entrance fee. Around $ 6.4 USD. It was as easy as one-two-three. We were dressed as beach goers in order to blend the crowed. We could have rented an awesome tent for 500 Pesos per person per night (around 11 USD), but our tent was enough for us three, remember, we were in an infiltration mission, we must act desperately! After pitching our tent at the middle of their empire for five seconds, we then scouted the whole place to familiarize the spot. And we were in awe as we saw their arsenal, the exquisitely built rooms and stunning beach for their guests! 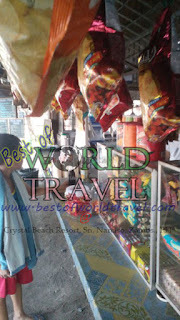 The Crystal Beach resort has a lot of houses where tourists can be accommodated. There are few modern designed rooms but the most stunning of all are the indigenous Filipino styled houses like the Nipa Hut (Bahay Kubo), where the building is primarily supported by bamboos. These Bahay-kubo styled houses have the common “nipa” as the roof and light materials such as bamboo rods and mats called “sawali” as the walls. Truly a majestic place that shows the culture of the Filipinos. The first thing we noticed upon checking out the beach houses were their names. They were named after biblical names and famous words such as Mathew, John and Malachi (the message). Not just cultural, but also a religious empire! According to the Tripadvisor reviews, some rooms are well maintained, but some are not. It just seems to differ on their opinions. Since the team was not able to enter even one of their rooms, we could not exactly tell what are happening inside those facilities. Our psychic powers was not able to infiltrate their bamboo walls, it seemed that our powers were weakened as we entered their empire! You can check out their hotels here and you can book there as well. Wanderers are not only limited in booking to their hotel rooms, but you can also bring your own tent (just like what we did), or rent a couple of tents from their armory. Moving out from the hotel rooms, the infiltration team have also seen a couple of state of the art facilities such as the Dining Hall brought to you by Domingo’s Grill & Restaurant, clean bath and toilet rooms, pine woods, the pigeon’s hall and an under construction concert hall. Yes, they do concerts here when they have events! Local artists visit the Crystal Beach Resort every now and then. The resort also has a micro-grocery/variety store (sari-sari store in the Filipino language) where you can buy your immediate needs such as cooled drinks, snacks, toiletries and stuffs! They have a few “duyan” and a cowboy-like training material (lol) and also a pool house just near the far eastern part. After a Mach 20 speed of taking photos and videos of this whole affordable beach resort in Zambales, we were ready to swim in their ocean! 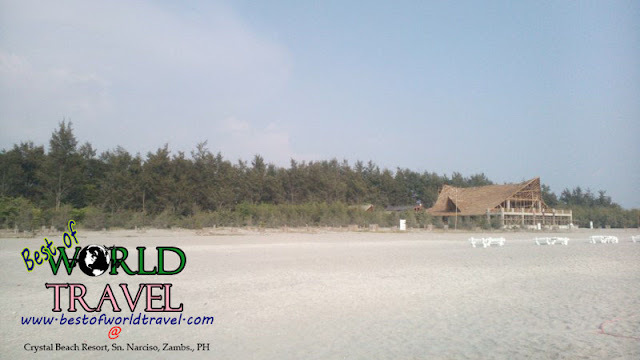 A feat that we must face to know the capabilities of the Crystal Beach. As amazing as the rumors say, they have crystalline like sands that eats our feet as we step on them. The sea was so blue in the morning until the afternoon. But it hides its color as dusk comes to us. The waves were so intense that makes it a good surfing spot. Our bodies can easily be dragged by the ocean if we were not too careful. That is a concert hall in construction? Children can only be a few feet from the coast since the waves were so strong, other non-swimmers are just sitting along the coast to receive a full blow of the waves. This actually makes the empire hard to infiltrate by the sea. There were also a couple of cottages where everyone can relax and eat. The breeze was so calming that even at the middle of the sun’s heat, you will feel comfortable in your chosen place. Such safety by air and on the seas. The ocean was so clean unlike what the seas of Olongapo and Subic can share to you. We have not found a single trace of algae, plastic bottle, or worse~~ human wastes! Fortunately, none of them existed in this empire. But just on the very far side of the resort lies some trash near the pine woods. It was around 100 feet away from the ocean. We still saw a couple of darkness inside the territory, but there were also a couple of beach cleaners, so they might be actually on their way to clean them up! But who should we blame in this kind of situation? It’s not the resort itself, it’s not the empire itself, but the people who stay on it, the people who uses the beach. So for those who are planning on visiting this fabulous resort, please, leave no trace but your footprints! Surfing in Crystal Beach Resort is not as easy as one-two-three. There are a couple of things that must be nailed into your minds such as: being fit, safety, weather, how strong are the waves and your own self confidence that “you can do it!”. There are around five levels a surfer can be put into. Just like some Massive Multiplayer Online Role Playing Games (MMORPG), surfers must start from level 1 until you reach the level cap, in this case, level 5. 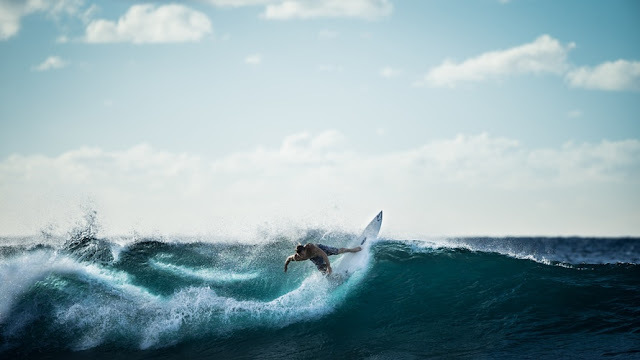 On the first level, you are to be taught the introduction of surfing, much like your main quest to learn what are the dos and don’ts of surfing. This includes basic balance, posture, foot stance, arm position and understanding water currents. You can read more about their surfing quests in their surf page here. You can also find interesting surfing photos on their Official Facebook Fanpage. Their 400 PHP per hour is one of the cheapest surfing lessons that we had heard, so we really recommend to try their surfing experience! It is fully packed including the equipment and other fees. But during that time, there were some unforeseen circumstances, so it was a no go. After a whole day of swimming, we now enter the most silent of them all, the night life. But we were too naive! The party has just started! Oh come on! Crystal Beach Resort also offers a stunning view at night using their bonfire at the middle of their empire. There were also some colorful lights just near the ocean. But swimming is prohibited after 6PM. Everyone were so happy that some people started dancing and laughing! An exquisite banquet indeed! Everyone can be your best of friends! We slept after everyone got tired, some were too tired, but we woke up early to know more information that we can add into our scouting log book. The morning was a bit hot even though the winds were blowing. Everyone were still fast asleep but we were already ready to rock. There were a few travellers swimming on the high waves, but the life guards were still not on their station since it was still five or 6 am. There wasn’t much to do during the morning but to eat, swim, and get ready to roll away at the Crystal Beach Resort. A majestic and memorable two day one night stay. If you happen to read our whole reconnaissance post, the Crystal Beach Resort had a couple of life guards stationed in their tower, and are ready to jump in case of emergency. The swimmers are very much protected. But on the other hand, just like what other traveller’s review at Tripadvisor, the gate seemed to be easy to walk in. We could have been talking to a registered Crystal-Beach-goer or just some random passerby. They could be a surfer… or a drunkard! Well, especially the ones on the beach proper, we saw lots of unknown people come and go unnoticed just by sneaking on the ocean’s current. Oh my goodness gracious grace! But I think it is pretty much very common here in the Philippines? 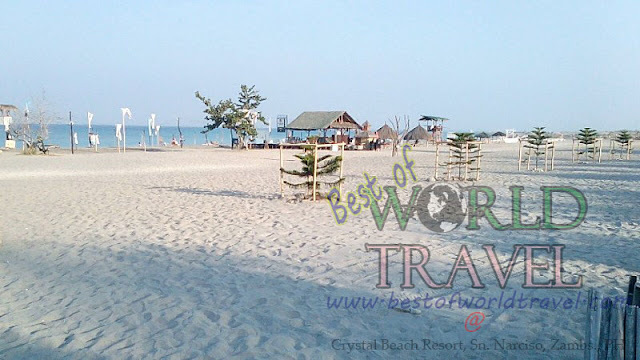 The outside was crowded with other resorts but the Crystal Beach Resort overpowers them in terms of popularity and service.Even the local residents purely recommend Crystal Beach Resort among the rest! Not believing us? Ask them! See how we had nightmares in Sabina Beach Resort. There are a couple of micro-groceries and a basketball court near the site. You can buy to these groceries and fill your stomach. If you want fish balls (some Filipino food), we saw a couple of local vendors. There were also taho (soya), balot (an exotic Filipino food), and some souvenirs! 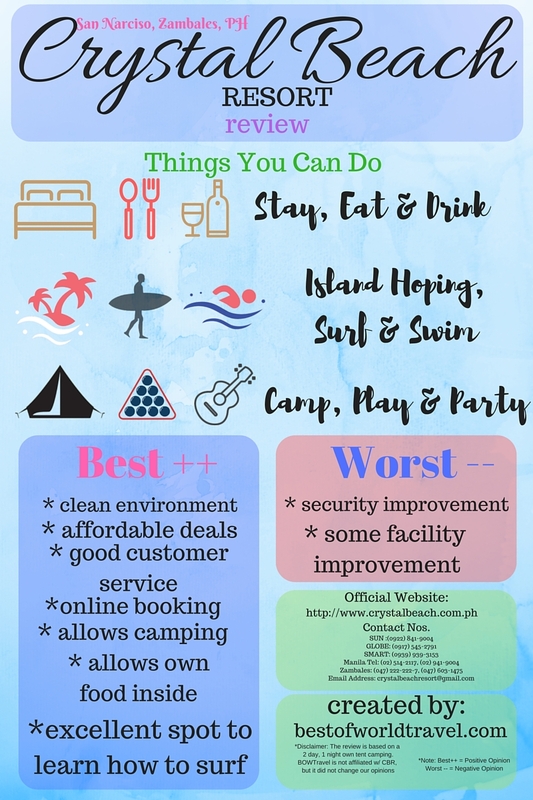 Crystal Beach Resort is a cheap resort in Zambales where your money can lead you to a great experience, but it is not for everyone. She has a very strong wave that is good for surfing, but it also backfires because for a family trip that only wants to “swim”, it will be hard for them to enjoy the ocean, especially the little ones. The waves can be a little scary, but adult people can enjoy the ride just like how you can experience a wave pool. The facilities were awesome, the staffs were polite and kind. 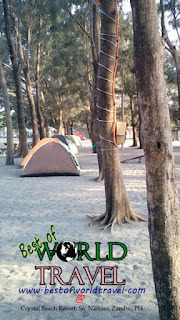 The camping feature (bring your own tent) was a great idea where other beach resorts do not host. 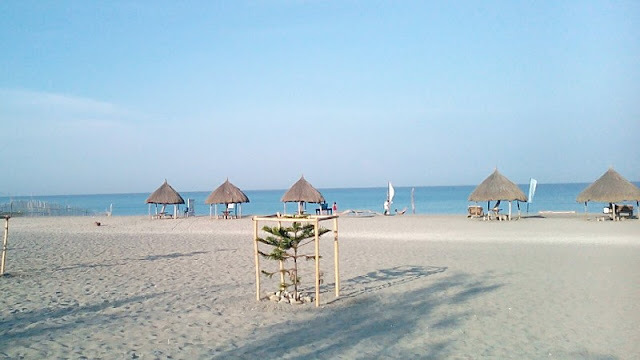 As an adult, we literally enjoyed the waves of the best beach in Zambales, the Crystal Beach Resort– and we swam happily ever after. 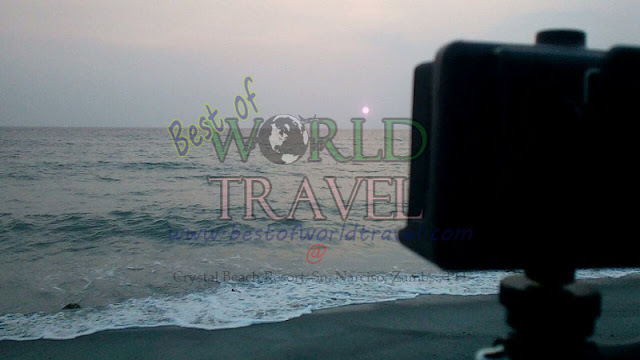 *Disclaimer: The Best of World Travel is not affiliated to Crystal Beach Resort, but it did not change our opinion and reactions about the site.